Dinner rolls are an essential part of my dining table. 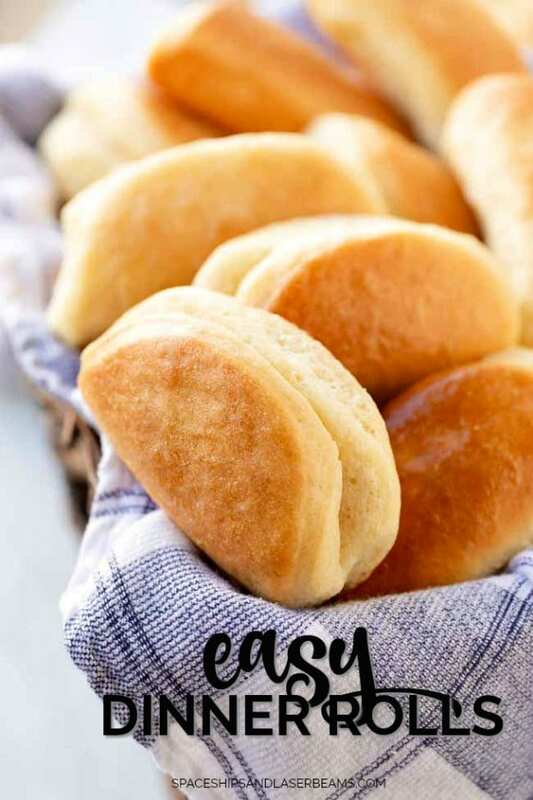 Whether it’s a family meal, buffet, birthday or dinner party, homemade dinner rolls are a necessity to make any meal feel complete. Growing up, my Grandma’s dinner roll recipe was everyone’s favorite. Whenever we visited she would make a fresh batch of her homemade dinner rolls so her home always smelled of freshly baked bread. Serve these rolls with our chili recipe, meatloaf or even this easy baked ziti or any other comfort food on your list. So many people are under the illusion that making bread is difficult. These homemade dinner rolls couldn’t be easier to make! Plus, nothing tastes better than a hot dinner roll that’s been freshly baked from scratch — and having your home smell of heavenly fresh baked dinner rolls. With less than 10 ingredients in this dinner roll recipe, there’s no excuse not to get baking. I’m willing to bet that you have most of these bread making staples in your pantry already. These fluffy homemade dinner rolls can be easily prepared and baked in the oven so there’s no need to get out the breadmaker. For any meal, great alternatives to these rolls include our awesome cheese biscuit recipe or even this delicious cornbread. Begin by dissolving yeast in ¼ cup of warm water and let sit until bubbling. If your mixture is not bubbling after about 5-10 minutes, toss it and start from scratch. 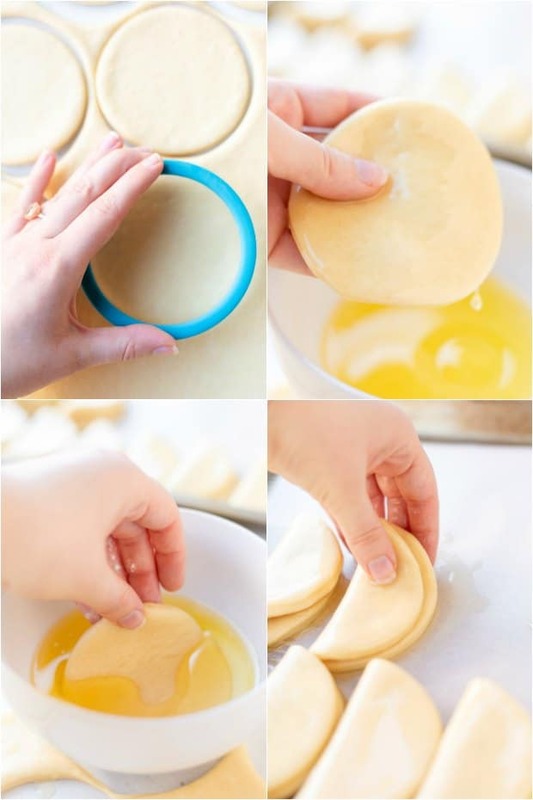 In a large bowl, combine eggs, sugar, melted butter, 1 cup warm water, and yeast mixture. Whisk until well combined. In a separate bowl, sift together flour and salt mixture. Add dry ingredients to wet ingredients and stir well. Once it’s difficult to stir by hand, use kitchen aid with a dough hook attachment for 5-8 minutes on low. You can also knead dough by hand for 10-15 minutes, or unit dough is soft and springy. Grease bowl and place dough inside, covering it with a towel. Allow dough to rise in bowl until it doubles in bulk, about 1 hour. 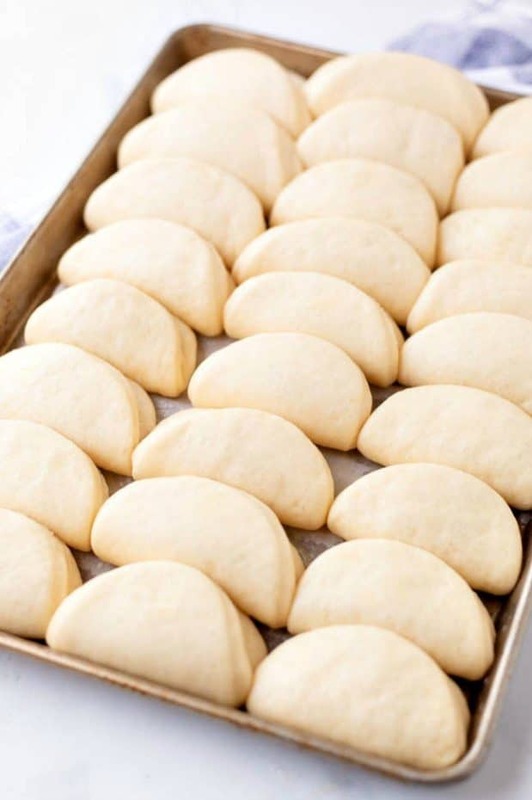 Once dough is risen, roll it out to about ¼ inch thick on a floured surface. Cut with a biscuit round and dip in butter. Fold in half and place on a baking sheet. Allow about 1/2 inch of separation between rolls. Once the baking sheet is filled, cover with towel and let rise for an additional 90 minutes. Preheat oven to 375 degrees once the rolls are risen. Bake for 12-15 minutes or until golden brown. These homemade dinner rolls are so easy to bake. From the moment the dough goes in the oven, set your timer for half an hour and start counting down the minutes until you’ll be pulling fresh rolls out of the oven. This classic recipe is so quick to cook that you’ll hardly have time to wash the pots before taking your dinner rolls out of the oven. Make sure you leave the dough to rise for a good half an hour if you want lovely fluffy rolls. 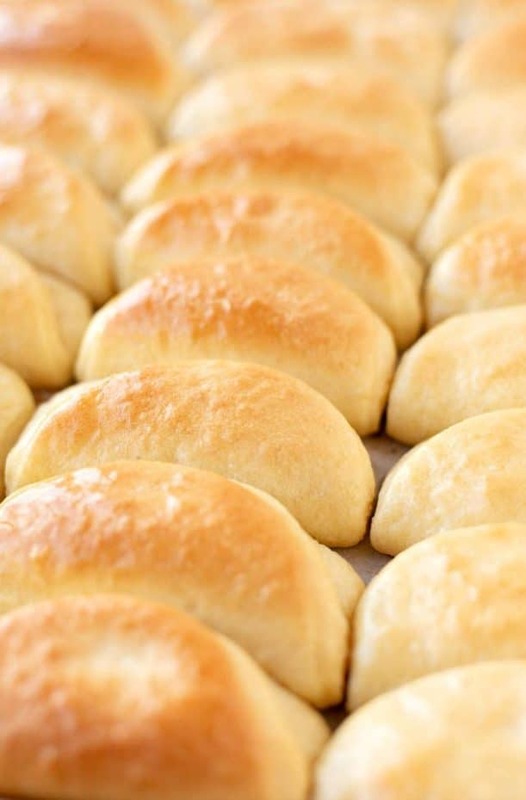 When I pull my traditional southern dinner rolls from the oven, I put them straight on the table for a family style tear and share dinner roll. 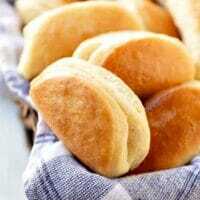 I think this is the best way to serve your dinner rolls because it means they retain their heat for a bit longer. I’m a firm believer that keeping it simple is best: a good old fashioned hot dinner roll with a generous smothering of butter that melts on the hot dough. Minutes before you pull your dinner rolls out of the oven, you could brush the tops with some melted butter for some extra shine. You could even add some garlic and herbs to the butter and put a tasty spin on an otherwise classic roll. When the rolls are still hot, you could also sprinkle a little bit of flaky salt on top of the rolls so it sticks and adds a bit of salty crunch to your delicious rolls. Once you’ve completely cooked your dinner rolls, you can freeze them. This recipe will keep for about three days in the fridge and up to a month in the freezer. 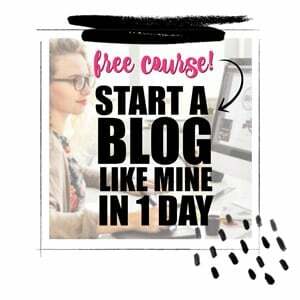 Although I’m doubtful that you’ll have your amazing homemade dinner rolls laying around for that long! Whenever you do want to eat your traditional dinner rolls, simply pull them out of the freezer and let them thaw before baking in the oven for a few minutes to warm them up. Even if you forget to let them thaw, you can put them in the oven for a little longer and they’ll still be delicious. These classic, fluffy, homemade dinner rolls are the perfect, delicious rolls your whole family will love! Dissolve yeast in 1/4 cup of warm water and let sit until bubbling. If your mixture does not start bubbling after 5-10 minutes, throw it away and start again. In a large bowl, combine eggs, sugar, melted butter, 1 cup warm water and yeast mixture. Whisk until totally combined. In a separate bowl, sift together flour and salt mixture. Add dry ingredients to wet ingredients and stir. The dough will become difficult to mix by hand - I suggest using a Kitchen Aid mixer with dough attachment for 5-8 minutes on low. If you don't have a mixer, you can knead by hand for 10-15 minutes. The dough should become soft and springy. Grease bowl and place dough inside, covering it with a towel. Allow dough to rise in bowl until it doubles in bulk, about 1 hour. Once the baking sheet is filled, cover with towel and let rise for an additional 90 minutes. Preheat oven to 375 degrees once the rolls are risen. Bake for 12-15 minutes or until golden brown. I love the smell and taste of freshly baked bread. But, I don’t always have enough time or patience to actually make it. This recipe is perfect. The rolls are so fluffy and delicious and doesn’t take all day to make.